Flip It Game Company has launched a Kickstarter for Flip It! their board game of real-estate renovations and reselling. 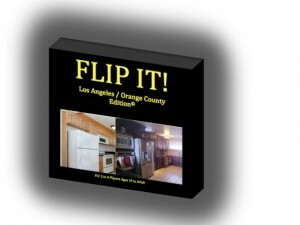 In this first release of FLIP IT! Los Angeles / Orange County Edition, Players adopt the role of skilled Real Estate Investors, who buy properties at auctions with the intention of renovating and flipping them. You are purchasing your property sight unseen, armed only with a picture of the exterior of the property and the neighborhood comparables. Sometimes the properties require only cosmetic changes while other times they are complete tear-downs.